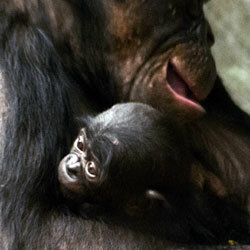 The Milwaukee County Zoo’s bonobo population recently increased to 18 with the birth of two females. Thirteen-year-old Elikia gave birth on May 8 and 17-year-old Tamia gave birth on June 29. This was the second baby for Elikia and the first baby for Tamia. Both infants are nursing from their mothers and thriving. They are also being cared for by other bonobos. There are an estimated 190 captive bonobos in Europe and North America combined, so each birth is significant to the overall population. Currently, the Milwaukee County Zoo has one of the largest captive bonobo collections. These births also represent a significant conservation accomplishment for this endangered species whose numbers are dwindling in the wild due to habitat loss, illegal hunting, disease and pet trading.